Which cushion suits your lifestyle? Diagnosed with congenital spinal muscular atrophy at only 11 months old, Mrs. C – now 60 years old -has lived with this challenging disability for quite some time now. Throughout all her life her dependability on others has been what bothers her the most. As a teenager she couldn’t just go out for a night with friends, she was depending on her parents for all her movements. Other than that she however never got any ‘special’ treatment growing up, she went to a normal school and participated to the best of her abilities. Mrs C. was able to walk until she was about 30 years old, after which she started using a manual wheelchair. After five years she switched to a power wheelchair, overtime transfers became more difficult as her limb and trunk muscles started to fail. She is now dependant on lifts for all her transfers. The arrival of an adjustable power wheelchair, an ETAC Balder in combination with Focal arm supports changed a lot as she regained her freedom to do things more independently. In her initial set-up mrs. C developed a category II pressure sore in the area of her IT’s. This was eventually remedied when she received a ROHO contour select cushion. Despite having contributed a great deal to the healing of the pressure sore, Mrs C. is not happy with her ROHO cushion. Her biggest objections is that she feels like she is constantly sliding out of her chair. Her partner and caregiver confirms this as he indicates that he needs to reposition her frequently on a daily basis. Apart from the sliding, she also indicates that on her current cushion she doesn’t feel comfortable going outside independently. Every ledge she has to go up or down she feels her position shift, unable to reposition herself this creates uncertainty and fear. During the positioning Mrs C’s hip limitation also needs to be taken into account, her wheelchair back and seat are positioned in a larger angle than 90 degrees in order to facilitate this. In order to assess her situation two measurements were conducted: an iShear measurement and a pressure mapping. The pressure map shows the ideal pressure redistribution qualities of the Roho cushion. Through the iShear measurement we can see that Total Shear Forces play a role and that the shear force is almost equally distributed. To prevent the sliding from happening, Mrs C. tried using a positioning belt. To her disappointment this did not help, the sensation of sliding and the actual sliding was not prevented. Besides this the belt needed to be positioned extremely tight also causing discomfort. Before starting the trial with Vicair, Mrs C. had one last meeting with a Roho consultant to optimize her positioning. This expert optimized her position at the event mrs C. attended by making some adjustments, it turned out however that on a daily basis this optimal position could not be maintained. Partially because neither her caregiver nor home care knew how to maintain the set up on a daily basis. When mrs C. first came into contact with Vicair at the Supportbeurs 2018 (rehabilitation exhibition) in Utrecht two cushions were suggested as possible solution: the Vector O2 and Adjuster O2. The Adjuster O2 turned out to be the most optimal solution, this due to its superior immersion and pressure redistribution qualities. Additionally the Adjuster O2 is extremely good in situations where the lines of the body need to be followed and the pre-ischial bar would minimize any sliding. Hence the clinical trial was started with the Vicair Adjuster O2, 10cm high. The initial set up of the cushion was not ideal so during the trial the cushion was adjusted into the optimal position. The figure below shows the adjustments that were made to the filling grade of the Adjuster so that Mrs C. was deemed to be positioned correctly. Again a pressure mapping measurement was conducted and an iShear measurement. When we compare the pressure map to the earlier situation, we can see that the pressure redistribution qualities of both cushions can be considered equally good. It’s noteworthy however that we almost see no trace of the legs on the pressure mapping of the Roho cushion. The Vicair Adjuster O2 pressure map shows in light grey a contour of the legs, indicating more support of the legs. After a trial of several weeks, the results are very positive: Mrs C is delighted with her Adjuster O2. She no longer experiences the sensation of sliding forward and indicates a great amount of stability. The first is confirmed by her partner as he no longer needs to reposition her, the correct position she’s being put into in the morning lasts all day. Mrs. C shows us that the gained stability on her new cushion allows her to have more function in her upper body: she demonstrates a movement of leaning forward that she was beforehand unable to do independently. There has been no record of pressure sores, demonstrating the AD qualities of the cushion. She also shows us that she has now changed the positioning of her feet, old pictures show her feet completely on the edge or half outside of her feet support. She shares that she took this position to sort of brace herself, trying to work against the sliding. Now her feet are normally positioned on the support. Summing up her story she tells us that she has regained her confidence to move around outside. The increased stability has returned her self-confidence to move onto, off and over ledges without ever fearing the consequences. 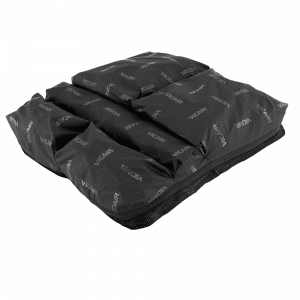 Which Vicair cushion suits you best? Use our wheelchair cushion selection tool and find your match! © 2018 Vicair. All rights reserved. Our website uses Google Analytics. The site collects anonymous information, like the number of visitors and popular pages. Google Analytics has been set up according to the new privacy rules, you can read more about this on our privacy page. We respect the privacy of our website visitors and make sure that the personal information you give to us is handled confidentially. We process personal information in a way that conforms to the rules and demands set by the General Data Protection Regulation. The information that for example is gathered by cookies, is used to serve several purposes. This website uses Google Tag Manager to collect anonymous information, like the number of visitors of the site and the most popular pages. By leaving this cookie active, we can improve our website.